The names by which the player can refer to the item. The description given when the item is picked-up. Example: "You take the teapot and jam it in your pocket. It cuts a striking silhouette." A description of the item as it sits in the room. 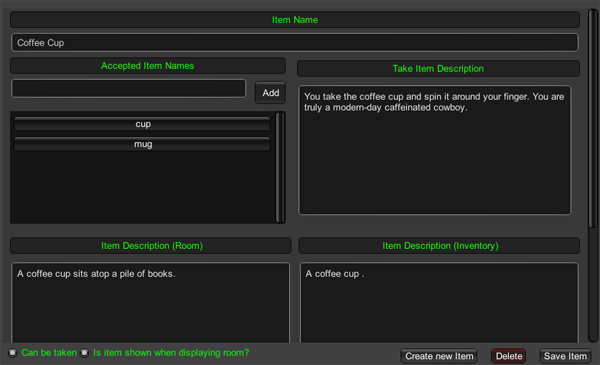 Example: "A red teapot sits on the desk"
A description of the item in your inventory. Example: "A red teapot, somewhat bulky." 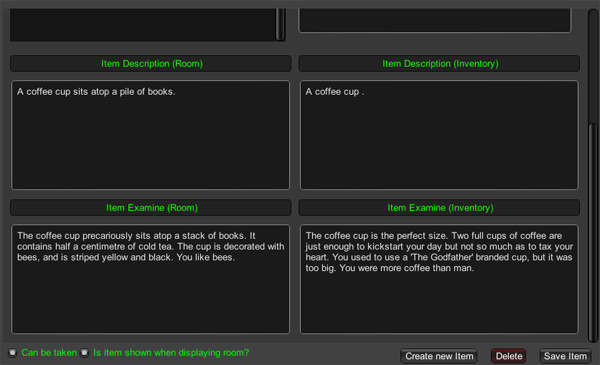 The description printed when the user looks at the item and it is in the current room. Example: "A teapot sits on the desk. It winks suggestively at you." The description printed when the user looks at the item and it is in their inventory. Example: "You are carrying a red teapot. It is not exactly an ultra-portable item"
Is the user able to put this item into their Inventory? Example: In general, a teapot is able to be taken, a faucet is not. Is Item Shown When Displaying Room? If true, this item will be shown when displaying a Room. This is a useful flag for creating more advanced logic. Create an non-displayed item "Self"
Place "Self" in the kitchen. Create displayed, non-takeable item "Oven"
Place "Oven" in the kitchen. The use-case "Push self into oven" is now valid and can have hilarious results.